BLOOMINGTON, Minn. – Gustavus men’s hockey head coach Brett Petersen has been selected as the Minnesota Intercollegiate Athletic Conference Men’s Hockey Coach of the Year, highlighting the announcement of the postseason awards, released Monday afternoon. In addition, Chris Amsden (Jr., St. Peter, Minn.) received All-Conference laurels, while the trio of Robbie Goor (Fy., Anoka, Minn.), Will LeNeave (Fy., Medina, Minn.), and Caleb Anderson (Fy., Sioux Falls, S.D.) were named to the All-Rookie Team. Petersen earns his third Coach of the Year honor, last being recognized in 2009-10. In his 18th season at the helm of the Gustavus Men’s Hockey team, Petersen led Gustavus to its first conference postseason appearance since the 2013-14 season, ending a three-year playoff drought. The Gusties finished the regular season with a 9-7 conference record to earn the No. 5 seed for the MIAC playoffs and earned a trip to the MIAC Championship game with a quarterfinal win over Concordia and a semifinal win over St. Thomas prior to falling at Augsburg in the playoff title game. Gustavus finished the season with a 12-13-3 overall record, more than doubling its overall and conference win totals from last season. 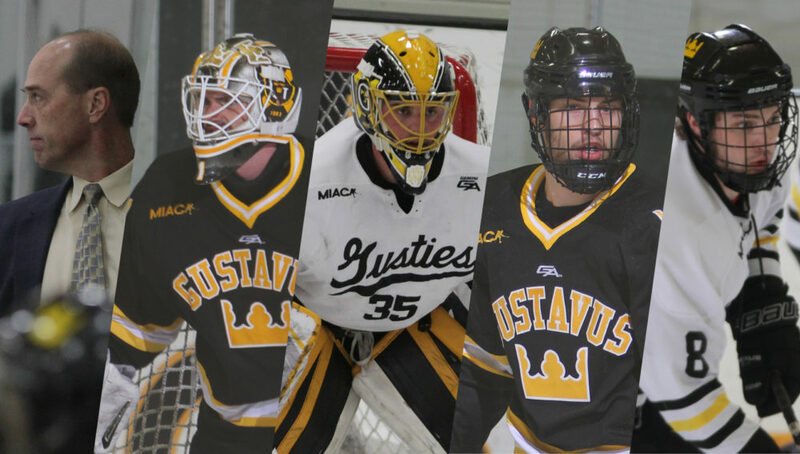 Amsden started in 18 of 28 games, backstopping the Gusties to nine of their 12 wins on the season as one of the top goaltenders in the conference. Amsden allowed an average of 2.21 goals per game (3rd/MIAC) along with a stellar .926 save percentage (2nd/MIAC). Amsden allowed under two goals in seven games, including back-to-back shutouts versus Bethel University Dec. 1-2. An instrumental piece in the team’s playoff push, Amsden guided the Gusties to a 2-1 over Saint John’s to clinch a MIAC playoff berth prior to helping Gustavus earn playoff wins over Concordia and St. Thomas. In three postseason contests, Amsden turned aside 86 of 93 shot attempts, including a career-high 45-save performance at Augsburg in the MIAC Championship game. First-year goaltender Robbie Goor was also a key contributor towards to the Gusties’ 2.4 goals against per game. The top freshman netminder in the conference, Goor started in nine games in Black and Gold, posting impressive statistics with a 1.87 goals against average and a .929 save percentage. Goor allowed under three goals in six of his nine starts in goal while finishing the season with a 3-4-2 record. The Gusties’ top scoring defender, LeNeave finished among the top-10 scoring defenseman in the MIAC with 11 points (2g-9a) in 26 games played. During the season-opener and his first collegiate game versus No. 13-ranked Augsburg at the MIAC Showcase in Blaine, Minn., LeNeave scored his first career goal, on the power play. LeNeave twice tallied two point game with two assists versus Bethel (Dec. 1) and at St. Thomas (Feb. 24). Anderson finished his rookie season in Black and Gold tied for third on the team in scoring while leading the conference among first-years with 15 points. Appearing in all but one game for the Gusties, Anderson led the team with 10 assists while adding five goals. Two of his five goals on the season came shorthanded (his first two career goals), which tied for the lead in the MIAC. Seven of his 10 assists came on the man advantage, while leading the team on the power play with eight points (1g-7a). Jake McCann (Sr., Shoreview, Minn.) was also recognized by the league as he was named to the All-MIAC Sportsmanship Team. Zach Doerring of Concordia was named the Player of the Year.